Lock in a great price for Eastin Grand Hotel Sathorn – rated 9.3 by recent guests! I love how convenient the location was. Hotel was connected to skytrain. The hotel was very clean, great views, amazing infinity pool and staff was incredibly helpful and kind. Everything about this hotel was amazing. From the food, the service, the staff, the rooms, I absolutely loved the pool. everything was perfect! Great swimming pool, good breakfest. Lobby is really nice. They have direct access to metro station from 3rd floor and that is super convenient. Famous Pat Pong block and many thai massage places are within the walking distance (~30min). Pictures taken from the hotel in the night. I like everything at hotel. Location is extremely good to access all other attractions and shopping malls because it has a bridge connecting to sky train at 3rd floor. The breakfast is absolutely awesome, it has lots of food to pick up, we all enjoyed it. We would recommend people to visit Chef Man at 3rd floor, which is hotel restaurant. I visited Chef Man since my last stay, this time I visited again because the food they served are fantastic. I will definitely stay at Eastin again by next time when I come to Thailand. Good breakfast, excellent location (directly connected to Surasak BTS), polite staff, excellent gym, clean and smell good room, everything is great about this place. Everything is perfect, the best part is that the sky train is on the 3rd floor of the hotel so it’s great no need for taxi. The staff was very helpful, super friendly. Try to be as friendly as they are to you! The pool on the 14th floor with an amazing city view, very relaxing, nice drinks. Breakfast really amazed me. As a vegan person I was able to create healthy and tasty meals. That is a Big Plus from me! Thank you! Massive and fantastic breakfast buffet. Great pool with sitting area. Several dining options inside the hotel itself. Direct connectivity with metro from inside the hotel building. Lovely city views from superior sky rooms. Exceptionally clean, outstanding service, connected to the sky train, a great buffet breakfast. Very convenient location near to the public transportation. Amazing infinity pool. Great staff. Excellent brekfast. 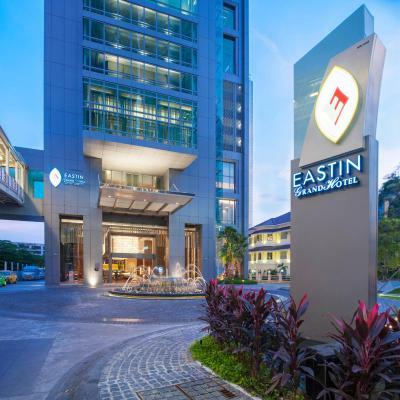 Eastin Grand Hotel Sathorn This rating is a reflection of how the property compares to the industry standard when it comes to price, facilities and services available. It's based on a self-evaluation by the property. Use this rating to help choose your stay! The luxurious Eastin Grand Hotel Sathorn is connected to Surasak BTS Skytrain Station via the hotel's own Sky Bridge. The hotel features an outdoor infinity-edge pool. A well-equipped fitness center and 3 dining options are available. Free WiFi is offered at this hotel. By Skytrain, Eastin Grand Hotel Sathorn is just minutes' from the rest of downtown Bangkok. It is a 45-minute drive from Suvarnabhumi International Airport via highway. Fresh and modern, the large air-conditioned rooms feature a flat-screen TV with 24-hour cable and satellite channels. A fully stocked mini-bar, tea/coffee making facilities and a personal safe are included. Bathrooms have hot-water showers, slippers and free toiletries. Guests can enjoy Chinese cuisine and Cantonese specialties at Chef Man or head to Glass House for a la carte menu, a lunch buffet and a foodie's fantasy at Blunos. There are variety of beverages and light snacks is served at Swizzles. Including free parking, the hotel also provides a business center, currency exchange and babysitting services. Laundry and ironing services are also available. When would you like to stay at Eastin Grand Hotel Sathorn? Presenting fresh and modern decor, this large air-conditioned room features a cable flat-screen TV, fully stocked minibar and tea/coffee-making facilities. A hairdryer and in-room safe are provided. Featuring fresh and modern decor, large air-conditioned room features a flat-screen TV and a fully stocked minibar. - Complimentary breakfast served at the lounge. - Open bar including wine, beer, spirits, cocktails and hors d'oeuvres from 5:30 pm-7:30 pm. There is a "smart causal dress code" for guests using the lounge at all times. Male tank undershirt's and tank top, swimwear, beachwear, bathrobes, flip flops and open sandals are not suitable attire for the Executive Lounge. Please note that the extra person charge is THB 2,943 per room per night including daily breakfast, one extra bed, and Executive Lounge privileges. Spacious corner rooms present fresh and modern decor. Fully air-conditioned, they feature a flat-screen TV and a fully stocked minibar. Please note that there is a "smart casual" dress code for guests using the lounge at all times. Men's undershirts and tank tops, swimwear, beachwear, bathrobes, flip flops and open sandals are not suitable attire for the Executive Lounge. Please note that the extra person charge is 2,943 THB per room per night including daily breakfast, one extra bed, and Executive Lounge privileges. On the higher floors, large air-conditioned room presents modern interiors. Includes a flat-screen cable TV, fully stocked minibar and tea/coffee-making facilities. A hairdryer and in-room safe are provided. 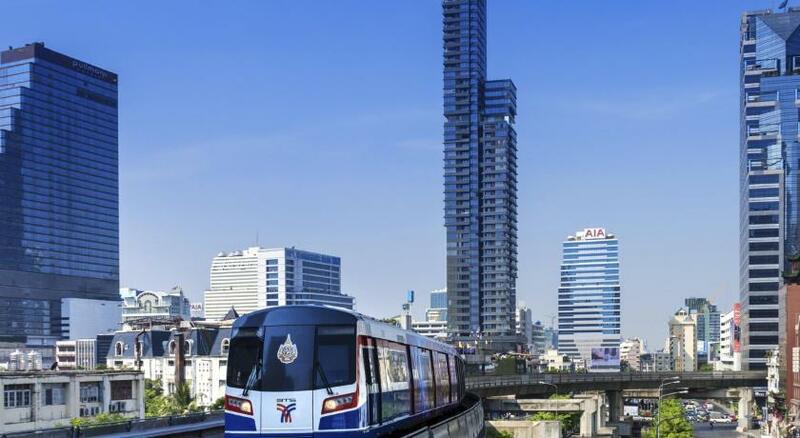 The luxurious Eastin Grand Hotel Sathorn is connected to Surasak BTS Skytrain Station via the hotel's own Sky Bridge. The hotel features an outdoor infinity-edge pool. A well-equipped fitness centre and 4 dining options are available. Free WiFi access is offered at this hotel. Hotel surroundings – This neighborhood is a great choice for travelers interested in temples, culture and sightseeing – Check location Excellent location – show map Guests loved walking around the neighborhood! House Rules Eastin Grand Hotel Sathorn takes special requests – add in the next step! A THB1000 damage deposit is required on arrival (around USD31.45). This deposit will be fully refunded at check-out, as long as there isn't any damage to the property. Eastin Grand Hotel Sathorn accepts these cards and reserves the right to temporarily hold an amount prior to arrival. Please note that the name on the credit card used for the booking should correspond to the guest staying at the property or guest may be asked to pay with alternative method. Please note that all guest rooms and hotel public areas are nonsmoking. Dedicated smoking areas are provided for guests who wish to smoke in front of the hotel. Guests are not permitted to smoke in hotel guest rooms and hotel public areas as per Thai law and are subject to a fine if they do so. Please note that an additional charge for extra bed for Superior Double or Twin Room and Superior Sky Double or Twin Room is THB1,766 per room per night. and an extra bed is charged at THB2,943 per room per night for Executive Superior Sky and Executive Deluxe Double Room. If an extra bed is required, the charges are to be paid upon check-in. A damage deposit of THB 1000 is required on arrival. That's about 31.45USD. This will be collected as a cash payment. You should be reimbursed on check-out. Your deposit will be refunded in full, in cash, subject to an inspection of the property. Superb in every way. Best hotel I've ever stayed in. Pool and bar gorgeous. Food excellent. Staff and service incredible. Loved the room, very clean and modern, lobby and breakfast areas were excellent. Good food and service throughout the hotel. Location to the BTS skytrain is excellent. Everything was perfect! I had no complaints, everything was according to website. Location is affected by rush hour traffic. However great thing the public metro system is connected directly. BTS metro connected. Amazing pool. One night I can hear people talk in around 3am in the morning from next door. A couple of more elevators would be great. We had to wait or travel up and down because the key didn't always work. Also a few more beds by the pool would allow for more people to chill there! Breakfast and breakfast staff were amazing! The room was super comfortable with a fantastic view. The location was perfect, ideal to explore the town. Loved being able to walk right into the Skyline metro! The pool was very welcome after a hot day out and about. All in all, lovely hotel! Rooms are quite basic but clean and comfortable. But everything fine. Conveniently located, excellent staff, excellent breakfast. We had a great time, we stayed 2 nights and enjoyed it very much. The pool with the great view, the perfect breakfast with fresh meals (and also soy milk!) and the helpful and friendly staff made our stay memorable. It is located near the skytrainstation and you get around easily. The drinks at the pool bar were very good and the happy hour was nice.